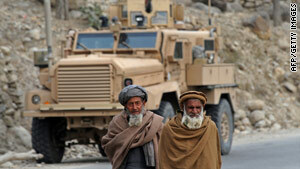 Two Afghan men pass U.S. troops in Nuristan Province, Afghanistan, on Sunday. Kabul, Afghanistan (CNN) -- U.S.-led forces in Afghanistan said Monday they are investigating reports that 10 Afghan civilians, including eight students, were killed Saturday in a coalition operation in the Narang district of Kunar province. "We will definitely be looking into this," said Col. Wayne Shanks, International Security Assistance Force spokesman. "We take these sort of allegations very seriously." Said Fazelayallah, governor of Kunar province, told CNN Monday that 10 civilians were killed. Coalition forces said they killed their military targets, he said, but a delegation sent by the governor to investigate reported the civilian casualties. Shanks said that, from the top down, civilian casualties are of great concern to the coalition, whether they be from military or insurgent action. Fazelayallah said the operation was launched without the knowledge of government officials in the province. Meanwhile, the U.N. World Food Programme said Monday that one of its workers in Kandahar, Afghanistan, was among eight people killed in a bombing on Christmas Eve. The slain man was a 24-year-old Afghan national who worked as a warehouse security guard, the United Nations agency said in a statement. He was off duty at the time and apparently was passing by on his motorcycle when the bomb exploded, the statement said. "I am shocked and saddened by this terrible loss," WFP Executive Director Josette Sheeran said in the statement. "Our thoughts and prayers are with the family, friends and colleagues of this dedicated man whose courage and commitment have contributed to our ability to provide food assistance to the hungry in southern Afghanistan." The blast killed eight people and wounded four, the WFP statement said. Kandahar province, in southern Afghanistan, is one of the Afghan war's main battlegrounds and a stronghold of militants.